Please consider giving a tax-deductible online donation. It's quick and easy, and a small amount can make a big difference. We can accept all major credit cards or a debit from your bank account simply and securely via paypal, and you don't need a paypal account in order to donate. You will be asked to provide your email or mailing address so that we may send you a letter for your records. If you have a gently used instrument, or one that needs a little maintenence to get it back to playing condition, we're interested. Typical donations include stringed instruments in need of strings, drums in need of a some new hardware or drum heads, band and orchestra instruments that have been played recently, and even pianos that are no longer being used. If you aren't sure if your instrument will be usable for someone else, we'll have it looked over by an instrument repair technician. Due to the expense of moving acoustic pianos, we cannot accept donations of pianos that haven't been properly maintained and stored, which includes regular tuning. If you have an instrument to donate, Contact Us today to arrange a pick-up or drop-off! There's always so much to do, that we need more people and organizations who are willing to help us out. If you or your organization would like to help out, please Contact Us today! 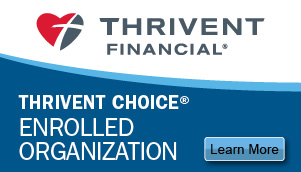 Are you a member of Thrivent Financial who�s eligible to direct Choice Dollars®? Choice Dollars charitable grant funds can make a world of difference to our organization as we work together to make the gift of music available to children in need. By directing Choice Dollars, eligible Thrivent members recommend where they feel Thrivent should distribute a portion of its charitable grant funds. Directing Choice Dollars is easy. Simply go to Thrivent.com/thriventchoice to learn more and find program terms and conditions. Or call 800-847-4836 and say "Thrivent Choice" after the prompt.